I saw this old 1948 Indian Chief picture and I thought you'd like to have it in your gallery. I know that I would love to have it in my garage or even better, I'd love to be riding somewhere enjoying the weather and the admiring looks from everybody I passed on the road. The word was that the bike was owned by an older man who had actually been an Indian Motorcycle dealer was for sale until yesterday when it sold for about $20,000. 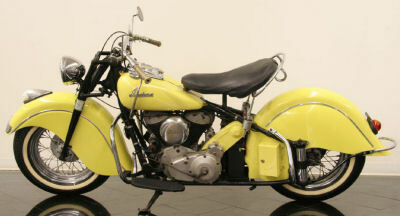 The thing that stands out about the Indian motorcycle is that it is painted a creamy, canary yellow. The owner said the paint job was done in the early 1970s. The only specs I have are that it is a 1200cc, twin cylinder with a 3 speed transmission. What I wouldn't give to have had the money to buy it, and maybe someday I will. But for now I'm keeping the 1948 Indian Chief picture taped to my refrigerator. Join in and write your own page! It's easy to do. How? Simply click here to return to INDIAN MOTORCYCLE PICTURES.